You’ll encounter wild horses in your journey and you can actually catch and tame them to become yours. There are certain horses that can only be caught in the wild so learning how to properly tame a horse will matter later on. This activity requires a lot of stamina so your early attempts may be unsuccessful. However, this activity will also give you a lot of stamina EXP in return, regardless if you’re successful or not. First, bring a bonded horse, preferably a breed that’s fast and has high stamina. 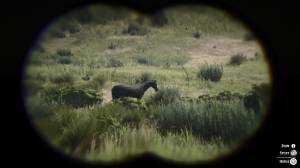 For wild horses, it will be a good idea to use your binoculars to study them and track the one you want to capture. Wild horses are very alert so it’s nearly impossible to sneak up on them without spooking them so a stealth approach is not necessary. So once you’ve set your sights on a particular horse, approach it quickly so you can close the distance immediately. Ready your lasso and throw it once you’re in range. 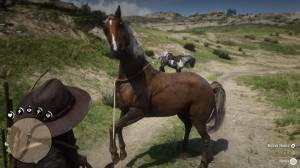 Once the horse is captured, you’ll need to approach it while pressing Square to help calm the horse down. When you’re near, mount it to start the horse breaking attempt. 1. 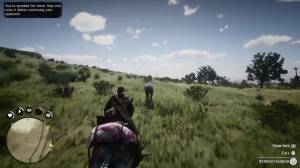 Avoid approaching an agitated horse from behind or it will kick you hard! 2. Your stamina will keep draining while doing this and you can’t use an item to replenish it. Once you mounted it, your job is still not over. You’ll have to balance yourself as the horse starts trashing about. Hold the left stick and hold it in the opposite direction that the horse is moving to keep balanced. If ever you get thrown off, the horse will escape and you’ll have to start over again. However, if you successfully tamed it, you can now use it as a temporary horse, or even transfer your saddle to if you want. 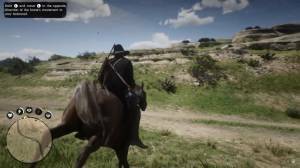 You can press and hold the Up DPAD to have your other horse to follow you closely. 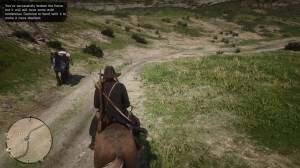 While having two horses, you can stow pelts and carcasses on both of them, allowing you to carry more.